OUR NEW REVAMPED WEBSITE & ONLINE SHOPPING PLATFORM WILL BE LAUNCHING SOON. From a humble beginning in 1990, Amedix has grown to be a leading dental company in Malaysia supplying complete dental solutions, from our own Attas dental chair brand & internationally established A-Dec dental chair and intra oral x-ray, W & H handpieces, Melag autoclaves, Complete Planmeca X-Ray Imaging solutions, Biolase Dental Laser to Roeko cotton rolls, paper points and Medesy Hand Instruments. 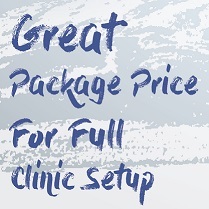 We provide full consultation advice on clinic upgrades and full clinic set-up, from design, licence application to equipping according to your budget. OUR FIRST RESPONSIBILITY IS TOWARDS OUR CUSTOMERS SATISFACTION. We constantly strive to deliver quality products from well established international manufacturers at reasonable prices. At Amedix, we will always conduct ourselves with professionalism and with integrity in our dealings. Our key aim is to fulfill all your needs so we can achieve sustained growth and development together in our business practices.